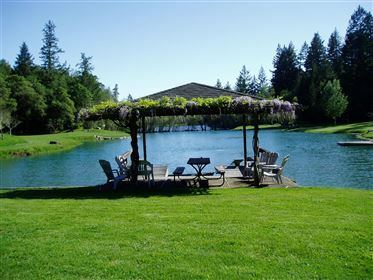 Secluded 25 acre valley with lake, 9 hole golf course, lighted tennis courts, wild life galore. Owner is contractor can alter/amend/add/delete structures/landscaping. Noise is not a problem. 4br main house, 3br guesthouse, barn. Staging/parking area. Robertson House is located in the best part of wine country. This 25 acre totally secluded retreat offers perfect weather almost year round. You will not find anything like it. It’s banana belt location close to the coast affords the cooling effect of the fog in a sunny valley. Among the groves of redwoods there lies a gorgeous lake surrounded by stunningly beautiful landscape. The golf course wraps the lake with verdant green. It is home to an incredible variety of wildlife. There are deer, raccoon, skunk, opossum, bobcat, and even wild boar. Osprey fish the lake as do egrets, heron, otters and hundreds of others. We have sculpted a world class golf course, a lighted tennis court, green lawns surrounding a magnificent lake. The grounds are meticulously maintained year round. The natural beauty of the site makes it an ideal location for filming and outdoor events. The property features: • Main house • Guest house • Barn • Ample parking and access for large vehicles • 9 hole golf course • Lighted tennis court (can be covered, used for reception and dance floor) • Boating, fishing, swimming • Fully irrigated play areas • Ample power and water. Click here for additional info.